ESA share of ~100mEuro taken from mandatory science budget. Current missions safe but future CV missions may be delayed. Good news. Was worried this might get shelved because of the amount of extra funding needed and after the TGO lander failure. Not everyone's going to be happy about this, me included. How does this work anyway, since science budget is a mandatory contribution and Mars program isn't (or is it now?). edit: They're claiming no delays to CV missions and directing funding to ExoMars will not be 'detrimental to science'. It's not at all clear to me how this is going to happen in practice. They are the way things shake out and ExoMars rover is high priority item and if they aren't going to increase the budget plus having to take on more work from Russia it was an inevitable result. Other news sources report that missions in development with launches through 2021 will not be affected. So far as I know, the only open call for new missions is the M5 call. However, substantial funding for that mission, due to launch in the mid 2020s will come after the ExoMars 2020 launch. The science budget is fixed, and 100 Euros will be transferred from it to the ExoMars budget. Space agencies try to protect missions in flight and in development from the effects of cuts. So presumably missions beyond 2021 are at risk. JUICE launches in 2022, so it could theoretically get a cut which likely would delay launch. A delay would also raise overall costs, so I presume ESA would try to avoid this. (Does anyone else know what the full list of science missions planned for launch after 2021 is?) But missions already in development with launches after 2021 may be the only places to raid for funds prior to the 2020 Mars launch. In all likelihood the savings will be in delaying start on these rather than trying to cut down missions currently being worked on. Delaying M5 or L2 probably wouldn't free funding in the timeframe needed for ExoMars.So if missions launching up to 2021 (Solar Orbiter, Juice, Euclid) are safe, Plato and/or M4 (selection next summer) would take the hit. Or maybe cancel plans for further S-class missions after the two already selected? ESA and Thales Alenia Space signed a contract today that secures the completion of the European elements of the next mission. The contract signed in Rome, Italy, secures the completion of the European elements and the rigorous tests to prove they are ready for launch. These include the rover itself, which will be accommodated within the Russian descent module, along with the carrier module for cruise and delivery to Mars. ESA is also contributing important elements of the descent module, such as the parachute, radar, inertial measurement unit, UHF radio elements, and the onboard computer and software. The science instruments for the rover and surface platform are funded by national agencies of ESA member states, Roscosmos and NASA following calls to the scientific community. Note the "flat tire" design of the wheels. This visualization presents a 360º view of the ExoMars 2020 rover. 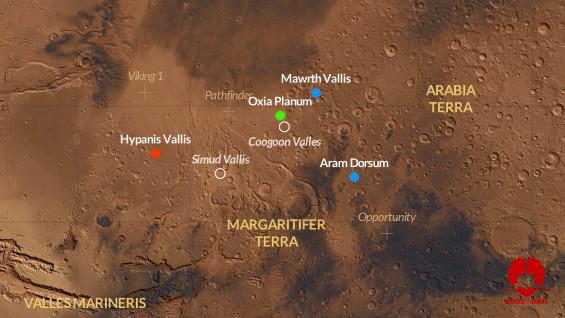 Two ancient sites on Mars that hosted an abundance of water in the planet’s early history have been recommended as the final candidates for the landing site of the 2020 ExoMars rover and surface science platform: Oxia Planum and Mawrth Vallis. My understanding from an inside source this was something driven by internal politics, not science or engineering. Oxia is a perfectly good site and bringing the already rejected back Mwarth back into the picture is unnecessary and unhelpful. IMHO! No updates on Schiaparelli investgation? Eh that's old news now. It seems to be screwed up sensors as the chief problem. Frankly I'd be more worried about if the Russians can properly assemble their surface platform. That was not my understanding; even back when Oxia was chosen for 2018 it was mentioned that the landing ellipses for the other sites were more favourable in 2020 and so they would reconsider. I cannot see how Oxia is interesting astrobiologically. Its clays are all of one type, laid down in a single global event, and bear no relation to the later Hesperian outflow which has heavily eroded it. Mawrth on a the other hand is a scientific candy store in comparison, clearly demonstrating dynamic geochemistry which could potentially have supported life. Albeit admittedly a bit more difficult site engineering-wise. And the Oxia unit is very likely also one of the ones present at Mawrth anyway. I cannot see how Oxia is interesting astrobiologically. Its clays are all of one type, laid down in a single global event, and bare no relation to the later Hesperian outflow which has heavily eroded it. I on the other hand don't see the attraction of Mwarth! Heavily altered clays are difficult to interpret, be the clays from hydrothermal alteration or weathering, and not particular good places to mind microfossils or biomarkers. Only sedimentary clays are good for that. Plus it looks to be rough and difficult to both land on and traverse. There are good reasons why it keeps getting rejected as a site. I think the LPSC 2017 abstract linked below makes a strong case for Mwarth: one of the most ancient sites on Mars' surface, deep layering of water altered minerals, and a complex geological history that may tell us what processes operated early on Mars (and will provide lots of complexity to interpret as you point out). The anti-Mawrth case was made by Dawn Sumner at the previous 2020 workshop. She interpreted the clays at Mawrth as part of the Oyama ejecta blanket, and therefore their original geological context is unknown. Mawrth fell in the ranking pretty quickly after that. Mawrth supporters don't seem to address that critique at all in the third workshop. She makes a strong case. I would be interested to see the other side, but you say that her objections weren't raised at the most recent ExoMars workshop.